Wine of France.Produced by Charles & Ruth Simpson at Domaine de Sainte Rose, their beautiful, boutique winery in southern France. The scallop shell was a symbol of reassurance to Medieval travellers and there is one embossed on a stone basin in front of the Château at Sainte Rose, where shelter was offered to pilgrims. This white wine is a deliciously drinkable blend. 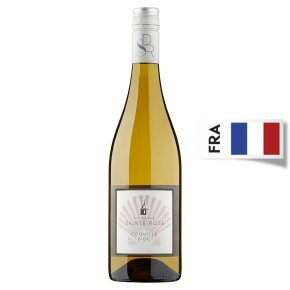 Fresh, zingy citrus fruit flavours and wonderfully peachy aromatics combine with a surprisingly rich finish making this a perfect light lunchtime white.